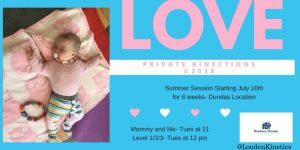 A new Summer session for Private KINections ©2018 will start July 10th. If you are a new momma and interested in getting back into shape this is the class for you! Private KINections is a physio based program with focus on pelvic floor restore. To participate in this program please book with one of the amazing physiotherapists at @blueberrytherapypelvichealth. With a pelvic health assessment Private Kinections©2018 classes are billable through your extended health.